Laxative. Relieves occasional constipation and irregularity. 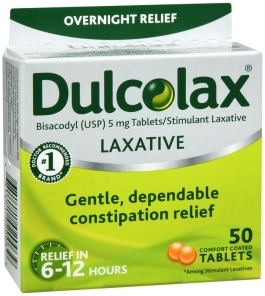 This product usually causes bowel movement in 6 to 12 hours. Adults and children 12 years and over: Take 1 to 3 tablets (usually 2) daily. Children 6 to under 12 years: Take 1 tablet daily. Children under 6 years of age: Ask a doctor. Do not use: if you cannot swallow without chewing. Ask a doctor before use if you have: stomach pain, nausea or vomiting; a sudden change in bowel habits that lasts more than 2 weeks. When using this product: do not chew or crush tablet; do not use within 1 hour after taking an antacid or milk; you may have stomach discomfort, faintness or cramps. Stop use and ask a doctor if: you do not have a bowel movement within 12 hours or if rectal bleeding occurs. These could be signs of a serious condition; you need to use a laxative for more than 1 week. If pregnant or breast-feeding, ask a doctor before use. Keep out of reach of children. In case of overdose, get medical help or contact a Poison Control Center right away.